Yuan Dynasty banknote printing plate and Chinese Huizi banknotes issued in 1160 A.D.
Banknote first emerged in China, where paper was invented, during the Tang Dynasty [唐朝] (618 A.D. –907 A.D.) in form of merchant receipts of deposit. It allowed merchants to avoid heavy bulk of copper coinage in large commercial transactions. By 960 the Song Dynasty [宋朝] (960 A.D. - 1279 A.D.), short of copper for striking coins, issued the first generally circulating notes used concurrently with coins. 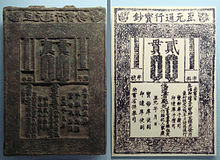 Paper banknotes were limited to regional zones of the empire and did not become a nationwide standard currency until the late Southern Song [南宋末年] era (1265 A.D. - 1279 A.D.). paper and printing technology, which created books to facilitate widespread of knowledge that eventually led to the Renaissance from the 14th to the 17th century and turned the concept of paper banknotes into reality. These Chinese inventions enabled some European nations to ascend to superpowers and built a hegemony that lasted for a few centuries. Sweden was the first European country to introduce banknotes in 1661. In March 2012, it came ahead than other nations in getting rid of them. According to the Bank for International Settlements (an umbrella organization for the world's central banks), bills and coins represent only 3% of Sweden's economy, compared to an average of 9% in the Euro-zone and 7% in the U.S. In most Swedish cities, public buses do not accept cash. Tickets are prepaid or purchased with a cell phone text message. A small but growing number of businesses only take cards, and some bank offices, which make money on electronic transactions, have stopped handling cash altogether. After the 2012 Canadian federal budget announced that the penny will be eliminated, Canada quietly followed suit a gradual migration to a cashless economy. On the cusp of the post-penny age, the Royal Canadian Mint introduced the MintChip, a form of electronic money. This initiative is hailed as the natural next step in the "evolution of currency." MintChip is a digital currency. Allegedly, it allows anonymous transactions backed by the Government of Canada and denominated in a variety of currencies. It is a secure smart card chip, which may be integrated with a SD card for easier connection to computers and mobile devices. The card contains a private key signed by the mint, which is itself then used to sign transactions. When making a payment, the sender gets the ID of the receiver. The chip reduces the balance stored within it and signs a message stating it has done so and that the recipients ID should increment its balance accordingly, this message is then presented to the recipients chip which verifies the signatures and adjusts its own balance. On Wednesday 4 April 2012, the electronic money concept was introduced when the Ottawa-based Crown corporation activated a website outlining its vision for the future of MintChip. In an introductory video (top left corner), MintChip is described as "better than cash" and "so easy even a child can use it." Software developers are invited to imagine different ways the technology could be used. The Royal Canadian Mint offers $50,000 in gold bullion and promotional expenses to winners of a contest aimed at developing smart-phone apps and other ways of demonstrating MintChip's benefits as a payment system for consumers. Contestants will receive a software development kit, two microSD MintChips and two remote MintChip accounts to integrate the Mint’s technology with the developer’s digital payment apps. Submissions will be evaluated between 15 August 2012 and 12 September 2012. There will be public voting during the same period of time. The winner(s) will be announced on 24 September 2012. One source cited that 500 contestants have entered in less than one week. Although the government has not announced or hinted that the MintChip will replace paper money, the Mint is clearly looking for a viable alternative to replace it, or at the least, to gradually supplement its legal tender function. One main mandate of the Mint is to provide Canada with a cost efficient and security effective legal tender (a medium of payment recognized by a legal system to be valid for meeting a financial obligation). Since the 17th century, European countries began to use paper money and metal coins until now. Paper money and coins are costly to make and to maintain due to wear and tear. Each Canadian penny costs the Mint 1.6 cents to make. The production cost exceeds the nominal value of the penny. That is why the penny was dumped. Furthermore, counterfeiting has always been a problem since the inception of paper bills. CNBC news footage of Professor Jonathan Lipow discussing the advantages of a cashless economy. Illegal activities, such as tax evasion, robbery, money counterfeit, illegal drugs trade, money laundry, illegal immigration, prostitution, illegal gambling, funding to finance terrorism, will be eliminated or substantially mitigated in an electronic cash economy. Underground economic activities are reduced to the extent limited by barter exchange. 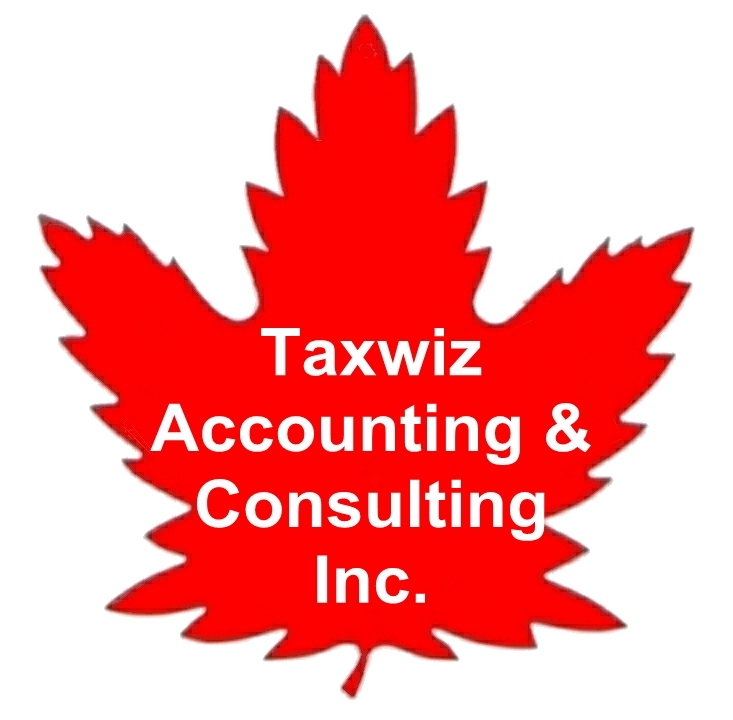 Valuable socio-economic data used in marketing, financial, economic, social study and policy analysis will be available conveniently and accurately at the press of a button, rendering the operations of Statistics Canada much more efficient and economical. It eliminates the need of printing paper money and making coins, hence reducing the cost of maintaining a legal tender system. Why Does the Government Keep a Low Profile in Launching MintChip? This is a drastic historical change that has security and privacy implications. Some believe that MintChip is designed to make covert government tracking possible through steganographically hidden data in the randomly generated nonces and transaction authentication codes. In Canada, government infringement on privacy is a political sensitive issue. Furthermore, there are concerns over marginalizing technologically-deprived Canadians. Launching this project quietly will mitigate public resistance. Garnering public support and user acceptance are vital to replace paper money. Incentives, monetary benefits and technology required to create a cashless economy are now present. In a world gradually migrating to one global economy, it is just a matter of time for astute leaders worldwide to recognize how their governments could benefit by adopting a new monetary system. It only takes a shrewd political maneuver to make this happen. Cash will eventually lose its function as legal tender and become a relic in museums. Like paper money, security remains an issue be resolved. Privacy is a major obstacle to gain public acceptance. A biblical prophecy written almost 2,000 years ago in the Book of Revelation (also known as the Apocalypse of John) sheds insight of how a cashless monetary system built on device (possibly microchips) implantation on human body could solve the security issue. The concept of electronic cash was inconceivable in John's era. It is doubtful that John fully understood what he was told to write. Yet the Bible predicts the use of a powerful means forcibly imposed on the populace to control trade, without which no one could buy or sell. John did not say exactly what this is other than a mark on the right hand or on the forehead. It allows government to acquire total control on the livelihood of all people, hence substantially enhances its power. The only option remains to those who refuse to partake in such system is to exchange by barter. Technology has transformed our lifestyle in many aspects. This prophecy is no longer a fairytale or a science fiction. In January 2012, India launched a nationwide program allocating a Unique Identification Number (UID) to its 1.2 billion citizens to build a new cashless biometeric system. The alleged purpose is to prevent identity theft and social welfare fraud. This is a reduced version of a full scale cashless economy. Even a developing country like India has the technological know-how and the incentive to build a cashless system. To realize a cashless economy, developed countries only need to pass a legislation recognizing a state-run electronic cash system as the only legal tender. A cashless economy will have little impact in accounting practice and procedures. However, it will significantly reduce the important of tax audit as tax evasion is almost impossible, except when taxpayers evade tax by exchange of barter. The emergence of MintChip pushes Canada one step closer to a cashless regime. This new development and the old prophecy provide food for thought on where mankind is heading to.